On the occasion of the exhibition Frans Post. Animals in Brazil and Hercules Segers the Rijksmuseum is hosting two symposia. On Tuesday 22 November Alexander de Bruin, curator at the Noord-Hollands Archief in Haarlem, will talk about his spectacular discovery of thirty-four completely unknown drawings of Brazilian animals by Frans Post (1612-1680). The recent discovery calls for a new perspective on the work of Post himself and the collaboration and interaction within the group of artists that joined Johan Maurits as governor of the Dutch colony in Brazil in 1637. Furthermore, on Friday 2 December a team of scholars will present their extensive research on the small, but yet mysterious oeuvre of Hercules Segers (1589/90-1633/40). For more information, see the Post-link and the Segers-link. The Rijksmuseum Amsterdam is organising an international conference on the consumption of early modern prints, ranging from precious artistic prints that were carefully collected to cheap printed images that were used and discarded: Paragons and Paper Bags. 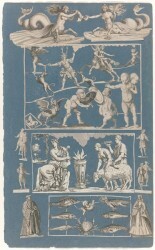 Early Modern Prints from the Consumer’s Perspective. The aim of this symposium is to further develop this new approach in order to achieve new insights on target audiences, the application and usage of prints, and special collection practices. The organisers particularly welcome object-based proposals regarding printed pictorial material or written primary sources. In early 2016 the Fondation Custodia is staging an exhibition of the impressive collection of old master drawings owned by John Fentener van Vlissingen and his wife Marine, Comtesse de Pourtalès. This exhibition, which ran at the Rijksmuseum in Amsterdam during the summer of 2015, will open in France on 30 January. 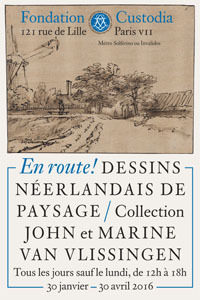 It features 100 drawings with ‘travelling’ as the theme – from sheets by seventeenth-century artists such as Rembrandt and Jacob van Ruisdael to nineteenth-century works by the generation that included Josephus August Knip (1777-1847). For the excellent exhibition catalogue, see Delineavit’s Publications page. The Brussels Print Room and the Bonnefantenmuseum in Maastricht are staging an exhibition of Master drawings from a Belgian private collection. This focus exhibition features ninety drawings from artists from the southern and northern Netherlands created during the 16th and beginning of the 17th century. Besides drawings by Frans Floris and Rubens there are sketches for prints, paintings, stained glass and tapestries, as well as figure studies of Hendrick Goltzius and Cornelis De Vos, and landscapes by Pieter Stevens and Adriaen Frans Boudewijns. Most of the drawings have never been shown to the public before. The exhibition Rubens, Van Dyck y la Edad de Oro del grabado flamenco presents 175 prints from the collection of the National Library of Spain and four paintings from the Prado Museum. It consists of five sections; the first dedicated to Rubens and the best printers of his works, the second to Van Dyck, the third to genre prints, landscapes and genre scenes, the fourth to Rubens and book illustrations,and the last to Rubens, Van Dyck and contemporary European prints. The exhibition is accompanied by a catalogue, 442 pp. (ISBN 978-844-92462-44-5). Copies can be ordered from the online museum shop for €39.